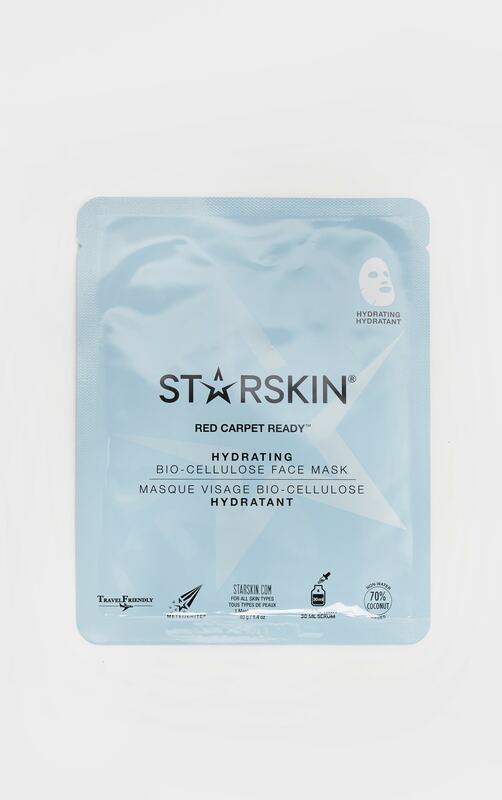 STARSKIN® Red Carpet Ready™ is a Bio-Cellulose Hydrating Face Mask that intensely hydrates for visibly smoother, rejuvenated skin. 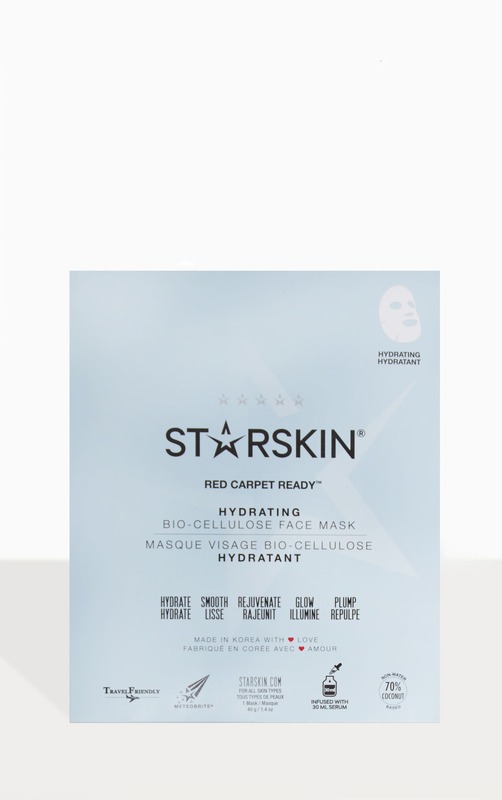 STARSKIN®’s premium Bio-Cellulose is formulated with naturally fermented, vitamin-rich coconut juice, and hydrates and conditions the skin without irritation. The translucent sheet is designed to contour closely to the face to deliver a powerful complex of skin-conditioning Amino Acids and Brown Algae to the skin. Each hydrating face mask is soaked in a full bottle of skin-plumping serum for a red carpet ready glow. Awaken dramatically dewy, supple, movie STARSKIN® in just 20 minutes. Ready, set, skin glow! Refrigerate the unopened sachet for 10 minutes before use to enhance the energising and cooling effect. Coconut Bio-Cellulose Second Skin Face Mask. Delivers intense hydration to dry, dehydrated skin. Easy-to-use, next generation Bio-Cellulose delivers results in 20 minutes. Cooling Second Skin hydrating face mask. Apply makeup after treatment for professional results. Use before important events to give skin a red carpet-worthy boost. Before opening sachet, use fingertips to gently distribute serum evenly. Open the sachet, take out mask and carefully unfold. Remove and discard the protective outer layers. Place the Bio-Cellulose sheet onto the face, adjusting the eye, nose and mouth openings. Gently smooth mask over entire face, eliminating any folds or air pockets. Leave on for 15-20 minutes before removing the mask. Gently pat any remaining serum into the skin - no rinsing necessary. Water (Aqua), Butylene Glycol, Glycerin, Betaine, 1,2-Hexanediol, Lactobacillus/Leuconostoc/Cocos Nucifera (Coconut) Fruit Extract, Chamomilla Recutita (Matricaria) Flower Extract, Hydroxyethyl Acrylate/Sodium Acryloyldimethyl Taurate Copolymer, Houttuynia Cordata Extract, Xanthan Gum, Acer Saccharum (Sugar Maple) Extract, Portulaca Oleracea Extract, Saururus Chinensis Extract, Ledum Palustre Extract, Artemisia Capillaris Flower Extract, Ethylhexylglycerin, Xylitylglucoside, Achillea Millefolium Extract, Ecklonia Cava Extract, Anhydroxylitol, Caprylyl Glycol, Arnica Montana Flower Extract, Fragrance (Parfum), Gentiana Lutea Root Extract, Artemisia Absinthium Extract, Adenosine, Xylitol, Glycine, Serine, Glutamic Acid, Aspartic Acid, Leucine, Alanine, Lysine, Arginine, Tyrosine, Phenylalanine, Valine, Threonine, Proline, Isoleucine, Histidine, Methionine, Cysteine, Acetyl Hexapeptide-37.